Today's news focuses on upcoming gadgets you might want to set aside some cash for, including new Xiaomi and BlackBerry Mobile phones, a new Acer gaming monitor, and a cheaper HomePod – here are all the details you need, courtesy of our friends at TechRadar. Nvidia's new breed of high-end G-Sync monitors are set to offer everything the serious gamer could want: speedy refresh rates, plenty of pixels, HDR and more. The 4K Acer Predator X27 is one of the most-anticipated models from this new line-up, and it just got a price thanks to a pre-order link on Newegg – you're going to have to pay a hefty $1,999 (about £1,490, AU$2,660) for the screen, so start saving. Shipping is slated for June. Samsung is continuing to develop the smart digital assistant called Bixby, in the face of stiff competition from the likes of Google Assistant, Siri and Cortana. The company just confirmed that the new, improved, smarter Bixby 2.0 is going to launch alongside the Galaxy Note 9 in the next couple of months – the upgraded app is going to be better able to hold a conversation and understand your questions, and will be faster in its responses. Apple is rumoured to be preparing a cheaper HomePod to launch sometime this year, and the latest leak to hit the web is that it's going to have Beats branding on it – making use of the company Apple acquired in 2014. Apparently the speaker won't have Siri on board and won't have the premium materials and sound of the original HomePod, as Apple looks to get the price somewhere in the region of $199 (that works out at roughly £150 or AU$265). 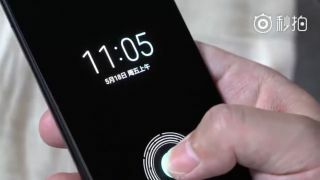 If reports are to be believed, many phone makers are currently trying to work out how to fit a fingerprint sensor under a pane of glass, which would mean we can all go back to pressing on the front of a phone to unlock it, even with no bezels at the top or bottom. A new leak suggests Chinese manufacturer Xiaomi is close to perfecting the tech, which we've only seen on one phone so far, and it could make its debut with the Xiaomi Mi 8. BlackBerry Mobile is launching a new handset on 7 June, and we just got a few more details about it – if the rumour mill is to be believed, that is. Benchmarks published online suggest we're looking at 4GB and 6GB variants for the RAM in the upcoming phone, plus a Snapdragon 660 processor and Android 8.1. Those internal components won't trouble the premium phones on the market, but they should be able to cope with most tasks very well.